Posted on January 21, 2019, in SMITTY, WWII and tagged 11th airborne, 1940's, 5th Air Force, Airborne, Army, family history, History, Military, Military History, WW2, WWII. Bookmark the permalink. 117 Comments. Oh, are you in Britain or America? I just saw a response from you, to someone, where you said “eh?”. This makes me think you are British. Sorry it has taken so long for me to answer, your comments for some reason were in my Spam file. I am thrilled that reading here helps you to feel closer to your son. All of us here ate very grateful for him giving part of his life to be of service!! May I ask where he’s stationed? Yes, is it okay with OPEC? I monitor these comments, so only you and I see them until I approve it. If you wish to say something that you do not want on-line, just tell me to delete it. I will read it and then delete. This comment is so beautiful to my son. Thank you! If you might write it on one of my HERO posts, I’d be immensely grateful. I am going to show him someday. Yes, I would love to tell you where he is stationed as long as it’s okay with OPEC Rules… do you know? The only OPEC I know of is the oil cartel of the Middle East, what would they have to with it? I’m not certain how OPSEC would feel about us discussing your son, so let’s refrain from further details to be on the safe side. I am just grateful for your site even though I am sure it is clear that I am not neither Military-Smart, nor Street-Smart… 😊You might wish to check SPAM, again, as I wrote you several more comments. Sometimes I have to check my SPAM, too, as messages will go there. Now that I un-spammed your other comments, you shouldn’t wind up in there again, but I’ll check to be certain. Selected comments of yours have been deleted as requested. Dat moet een indrukwekkende landverhuis geweest zijn :al dat materiaal en al die strijkrachten en hun voertuigenoverbrengen was zeker geen sinecure en goed doordacht. I know I would have had it all messed up, the logistics was great. After reading about all their hardships, it’s hard to imagine that we complain if the electric is off for a few hours. haha, isn’t THAT the truth. We are definitely spoiled, aren’t we? You sure said that right!! This is much appreciated, Rick. Done a bit of logistic planning in the past. But this is just off the scale. I would not have the slightest chance of doing this. Astonishing. I can do math, but hate it, so I wouldn’t even try to attempt it!! 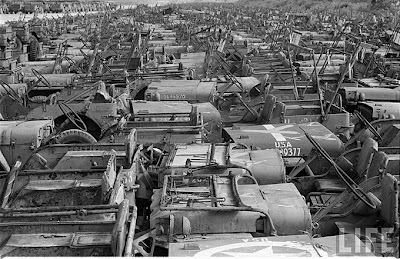 In two days they transported “11,100 men; 1,161,000 pounds of equipment and 120 special-purpose jeeps “. How on earth did the Japanese ever think they could even compete with, let alone defeat, an economic power of that magnitude? I bet they are wishing they could take back Pearl Harbor before the battle on Okinawa even starts. 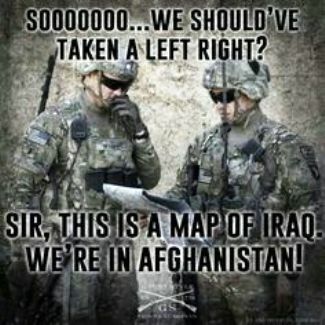 The logistics are remarkable, how our country banded together to make all that equipment and train that army is unheard of even today – and to think this is only one division!! I believe you’re right about some of the Japanese wishing things had ended earlier. If you’ve noticed, more of the enemy were deciding to surrender rather than commit suicide. Many were not following blindly into the fray at this point. The caves and tombs would have made good shelters, for sure. I bet they had some wildlife in there for company from time to time, also taking shelter. Oh jeez, I hadn’t thought about that, Lavinia!! I would imagine you’re quite right too! The details of the logistics never fail to amaze me. The other thing that caught my attention was the mention of the caves and tombs. The last time I was in Kansas, I stopped at a place called Battle Canyon, where the last of the Indian wars was fought in that state. 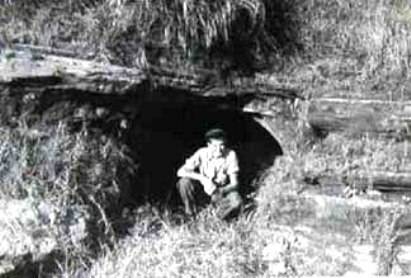 The Cheyenne had dug rifle pits and caves into the hills of a draw, where the women and children sheltered during the fighting. I suspect the Japanese efforts were more sophisticated, but it’s still interesting to see how the same basic technique spanned such different cultures. It does seem strange, but when you think about it, not unusual. There are pyramids in societies that could not have possibly talked with each other, eh? My husbands great grandfather, who is still going strong at 93 years old, was part of this group that you wrote about. Honored to read a bit of the story and see some pictures. I hate that we are losing these good people and the stories they can tell. Thank you for retelling them! He was with the 11th Airborne? Terrific! I love to hear from relatives and in your case, it would be outstanding to hear from one who was there!! Yes he was! He was a paratrooper but he didn’t jump there. He arrived by boat and the front opened up. They walked through the water with their guns over their heads to keep dry. My grandfather said everyone hated the general. The general was only there for about 15 days total. He said it was hot one day and would rain the next. Sometimes the 11th A/B was used more as infantry, but with all their training, they were a good start to special forces. You should be very proud. If one does not wish to sleep out in a typhoon, I guess the cave is a welcome site. It would be for me!! I think that about sums it up, Curt – good one! Even if they presumed the Emperor would give up, knowing just how determined the Japanese soldier was, they would not know what to expect. The unknowing must have been awful. Neither can I. I’m sure words doesn’t quite describe it anyway. Naturally I had to read the obit for Arthur Taylor the Dunkirk vet. After the war and being demobbed, he couldn’t settle down and rejoined the RAF and stayed for another 36 years! Glutton for punishment? You bet! Thanks GP I’d never have got to read about this man. They quietly live their lives and no one the wiser, no one knowing there’s a hero in their midst. In reading the book, “Duty”, it was the same for Paul Tibbets. I love to hear that I inspired someone to continue on with their own research!!! and this one was most unusual GP, I always check the obits but don’t often comment unless they are so far out of the ordinary. Then I am very glad you happened to check there. I have trouble finding WWII veterans from Australia, but I do try. I check the obits from YOUR posts GP You give me the leads to follow. I wouldn’t know where to start now. I know what you mean. I tried to find more on Floyd Kennedy from today’s post, but drew a blank. I had gotten the death notice from the 11th Airborne Association. Probably on the assembly line as we speak GP, at the rate things are going. I wouldn’t change my childhood either, it was one of the best! Your military humor segment got a pretty good laugh out of me today haha. Well done, as always! Thanks, The humor was important back then, now and for us – eh?!! What logistics! All those men and equipment. all those planes. my goodness. Thanks, GP. All that math – yikes! Hey GP…just want to say how much I enjoy your blog….and to say thanks for your response to “Sitting Pretty”. I’m not sure what happened but when I started to reply to your message everything disappeared and I couldn’t bring that window up again. So, just saying thanks here instead! Computer glitches are certainly above my pay-grade, Dave. lol Thank you for being one of those great people who find history interesting!! I enjoy your posts as well, I wish I had time to comment on each one. My apologies. To move that amount if equipment must have been a logistical nightmare. The conditions certainly didn’t lend themselves to a comfortable time did they! The more i learn about the logistics during this war, the more in awe I become. I know I don’t say it enough, but love your posts!! 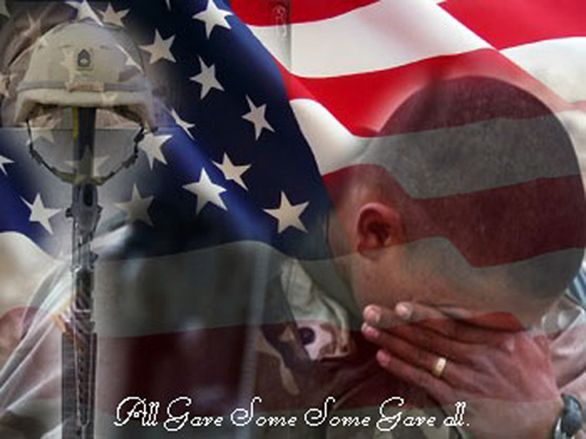 Thank you for what you do! It is super interesting to me, so it is definitely my pleasure, Kirt. I’m just thrilled when someone else finds it interesting as well. tell me about his bombing run episodes in Europe and laugh about the many holes his plane would absorb from enemy fire. Joe was a wonderful man. Stephen, if you would care to have me put Mr. Marsala in the Farewell Salutes, I’d be honored. You can see from today’s Salutes the type of info I like to include. They were a great generation, so full of life, honor, ingenuity and humor!! I hate that we are losing them!! Great post. I have a great uncle who was an airplane mechanic on Okinawa during WWII. I’ll bet he was kept pretty busy!! Any stories to share? Not many. Have never been real close to that branch of the family. I think he was a P51 Mustang mechanic. He would be worth his weight in gold to those pilots! Loved the safety briefing cartoon. It was pretty much true. Ours, on Fridays was–“Be Safe.” The rest, like in the cartoon, was implied. haha, it certainly sounded like something that would be right up a serviceman’s alley!! Thanks for dropping by, Adam!! Servicemen adapted so well to awful conditions back then. I cant imagine trying to sleep in a damp tomb, or old pillbox. At least they didn’t have to jump on Japan, something to be grateful for. Knowing how much Japan had hidden underground, I am thrilled they didn’t need to invade!! I’ll be in Okinawa in May. I’m looking forward to viewing this battle through their eyes. Going to see your son, Jacqui? That will be fantastic! You had better take a million pictures for us!! Ah, Okinawa, land of mud, maggots, and rotting corpses. So thankful the invasion of Japan was never needed! One can only imagine. . . . I have often thought about that. I discovered Japan had more hidden below ground than we ever thought – it would have been a very bloody invasion!! And you can’t do anything about the weather!! 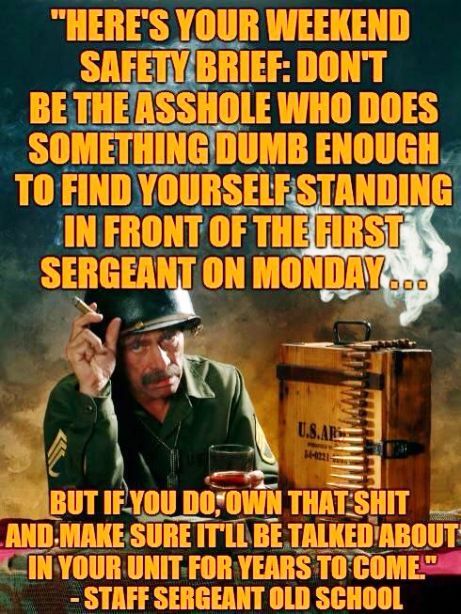 The military certainly has a way with words, don’t they?!!! The fact that they had 600 planes at their disposal is remarkable. Our manufacturing, by the end of the war was crazy! Isn’t that the truth!! Everything was basically popping out like hot cakes and NOT going directly to Europe first. They must have been amazed! A soldier’s nightmare to suffer through a torrential rain in a pup tent! Adding to the physical discomfort would have been rumors, stories about the bombs that had been exploded and general uncertainty. Fascinating info. The typhoon touch was a surprise and provided info I had never thought about or suspected. The weather all through the Pacific side of the war was as dangerous as the enemy, if not more so! Indeed. But at least most of them did not have to deal with snow and ice–just heat, humidity, typhoons, jungle rot, and tropical illnesses. No wonder boot camp is so impossibly hard! Look what they’re up against. They have to be able to survive anything. The more training, the better chance for survival that’s for sure! The old adage, the more you sweat in training, the less you bleed in battle. Some of those jeeps ended being recycled to become the colorful Filipino jeepney. So I have learned, Rose. Actually I was quite happy to see them being still useful! It is a Philippine icon. Those caves were a godsend for the Japanese. I liked your image of the ballooning tents like parachutes on the sides of the hills. I can see it and I feel cold. How miserable! I got a taste of it yesterday trying to shop in the damp, cool wind we had! Sure wouldn’t want to have tried to sleep in it!! Thank you very much, John, for sharing.